Commissed to add seating to the Yeouido Tunnel entrance area, we designed a continuous timber lattice bench. Developed out of our interest in experimenting with the translation of digital design methods into timber craftsmanship, the fluid shape of the bench grows out of the surrounding landscape to offer an informal resting area facing the river. 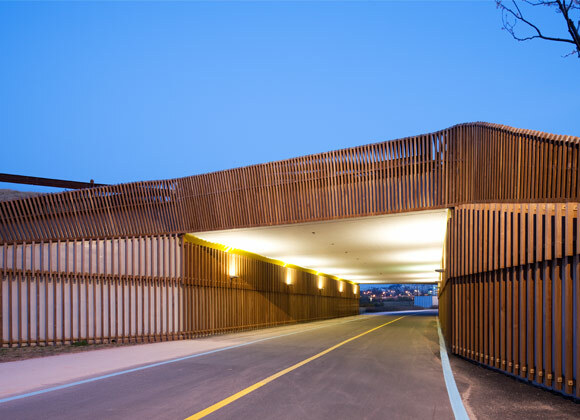 We remodeled Yeouido Cycle Tunnel by using lighting and timber slat cladding to create a dramatic effect and integrate the tunnel with the surrounding landscape. The timber slats reach out along the cycle route and playfully wrap around the retaining walls. On one side of the tunnel, which runs in parallel to the river, the timber forms a generous timber bench used frequently by cyclists.